Back when I was new to covering esports, I was eager to jump in to the Halo scene as it was and still is my favorite game franchise of all time. I was immediately met with a collective cold shoulder from fans and players as I tried to engage them so I could tell their story. Being a woman in that space at that time was incredibly tough to navigate, so I gave up on covering esports for a long time. This time around, things are different, not perfect, but definitely different. There are a lot of new faces now and one that grabbed me immediately was Lottie Van-Praag who popped up in the Halo scene as a presenter. She brought a lot of energy, intense passion and was well versed in game knowledge. I loved seeing a woman making her mark in the scene and being welcomed with open arms. 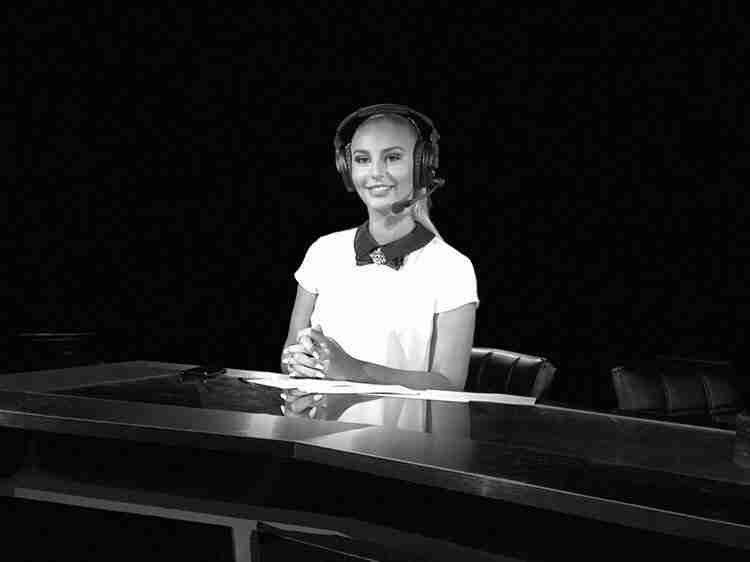 I was over the moon when she made her very quick transition to broadcaster at the desk. I caught up with Lottie at the Halo Championship Series in New Orleans and she is an absolute delight! She radiates with positive energy, you could tell there was no place she would rather be at the moment than right there in he middle of all the HCS action. I couldn’t be more thrilled that she gave me the opportunity to pick her brain. Rebecca Rothschild: What drew you into esports and Halo in particular? Lottie Van-Praag: I had grown up with gaming from a young age, since the days of Halo 1 and 2 I was hooked on my consoles. Halo is the first game that got me hooked and my brother and I would complete the campaigns again and again; Halo was what bonded us together. I vividly remember playing Tomb raider on my PC and in complete awe of the graphics, almost unable to believe that I was battling a tiger in an underground cave. My love for gaming has only grown and I now find myself hosting and presenting some of the best esports in the world, my experience of gaming has been and continues to be incredible. I love getting lost in another world and having challenges to overcome in game as well as watching how the industry grows. E3 is a demonstration of how gaming can evolve, it’s so much more than game play now, it’s the graphical enhancements and the beautiful artwork that so many designers create, as well as the communities around gaming that have taken me under their wing while I present the esports they love. Every part of gaming to me is an example of how hard an industry can work and grow to its upmost potential. I see so many talented females in esports now and truly believe that they can continue to game knowing that the industry is behind them, and that is from my personal experience. I am completely aware that there is a gender gap but if we all work together to abolish this stereotype I believe one day we will see an esports world filled with a mixture of both male and females on our screens. RR: What do you think is the biggest misconception about being a broadcaster in esports? LVP: The biggest misconception of being a broadcaster has to be the amount of research we do in order to do our jobs properly. The hours of work and research and preparation I do in order to give the best I can to the esports fans and viewers is crazy, I will never go under prepared. I want to give the best I have for a broadcast and know exactly what I am talking about and who I am talking to. RR: Is having a seat at the HCS desk pretty much the peak of what you want to do with esports or do you have goals beyond that position? LVP: Oh for sure, I always think it’s important to reach your goals and this is a goal I didn’t see coming my way as quickly as it did. I am unbelievably grateful for being part of this amazing game and the community that drives it continuously with love and passion. I also think it is important to make new goals especially once you have reached your current ones, so despite what I have achieved so far in such little time, I only want to get bigger and better at what I do. RR: You also love playing sports. Is there anything from your athletic sport experience that you use in your gaming? LVP: 100%! I used to represent my country in Lacrosse and have done that since I was 14! I see massive similarities between gaming and sports and when I game or try and breakdown a play that I am watching from the desk, I can’t help but notice the teamwork and tactics that are there in front of me. Having a team ethos and knowing how to work together efficiently makes a perfect esports team and traditional sports team. RR: If you could make one wish for the future of esports, what would it be? LVP: To be a part of a future in esports that accepts every culture, race, gender, shape and size into the community and celebrating the different people all over the world coming together to play games they love. You guys see why I love this lady so much? Thanks again to Lottie for being so open with us here at Sugar Gamers. If you wanna keep up with Lottie follow her at @Praagy08 for both Twitter and Instagram. If you wanna see Lottie in action, catch her on the Halo Championship Series streams.